This is actually a mod of fts and fifa 17 Apk with Data obb for your android smartphones. The game which save data and has a free mod coin, was developed by a programmer known as Rizky. In case you want the official first touch soccer 2017.and that of fifa 2017, by clicking on the link of each game, will navigate you to the main post where you can download, install and play the game. 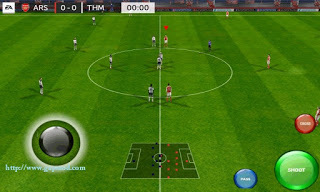 As the name appears to be, “FTS Mod FIFA 17” was actually combined with the feature of first touch soccer and that of fifa 2017 in order to get a nice and great functions for the product game. When any game is named after mod, just know that the game was redesigned out from the official released game in order to give a more better experience while playing. >> Also Download and Play Football Manager Mobile 2017 - FMM17 Free Android APK+MOD+OBB Data. Below, we provided the feature of this latest FTS Mod FIFA 17 by Rizky and that of the free direct download link for the games. Just read on and inspect if the feature suits you. If yes then proceed to download the game on your Android smartdevice. Android: v4.0 – v4.0.4 [Ice Cream Sandwich], v4.1 – v4.3.1 [Jelly Bean], v4.4 – v4.4.4 [KitKat], v5.0 – v5.0.2 [Lollipop] and UP. >> Download FTS Mod FIFA 17 Apk + Data Obb. Installing the mod app game is quiet simple and easy, as what you need to do to is first download the game from above links. Next click on install to have the game installed on your Android device. And for a game that uses the the Data/Obb file before it can play, you are required to download the "Obb" files/"SD" file. Then you can now forge ahead to download and get the game installed on your device. And if the file happens to be at .zip or. rar file format, then extract the first file to your sdcard memory. Next is to move the extracted folder to this particular folder or location: /sdcard/Android/obb. When done with that, go ahead and enjoy the game.